Emalie and I made it out to White Rock Lake after I got off work. We set up in our usual spot, the water, for the most part was fairly clear until you got closer to some over hanging dogwoods. I noticed a number of undiscernible fish taking things off the surface, I am pretty sure they were small bass and sunfishes. This area has alot of grass carp but I usualy see them mucking on the bottom or cruising through, rarely on top. We began to cast and I had a few bites but nothing that was commited or that I could set quick enough. 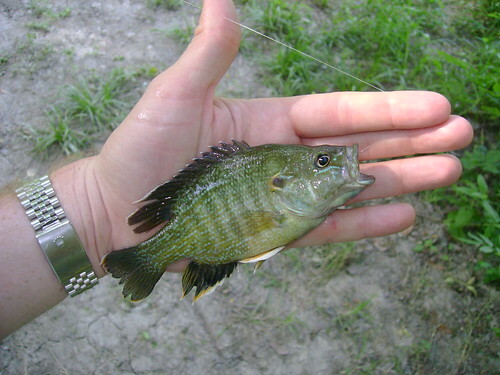 I really believe that with panfish you get alot of "test" bites that you never even feel. When they are being picky they nibble and spew pretty quick. We were about to give up when i tried one last cast in the direction of my favorite little sandbar, and I was lucky enough to catch this little guy. After we packed up we went to look at houses!